I have written before about the slow development of what has come to be known as the "family tree", including reducing human network relationships to a tree-like form (Reducing networks to trees), and presenting it as an actual tree (Drawing family trees as trees), rooted at the base (Does it matter which way up a tree is drawn?). Most of the early representations of pedigrees had the people's names enclosed in a circle, called a "roundel", and it was these roundels that were connected to show the family relationships. One of the steps on the way to a tree was thus dropping this idea, so that the names could be connected directly. Interestingly, the earliest pedigrees that do not have roundels also date from this early period. As noted by Nathaniel Lane Taylor, the importance of this development is that: "the scribe relies on the power of the names themselves to anchor a diagram on the page, with lines simply taking the place of any syntax needed to describe the filiation." That is, no abstract iconography is needed. c. 1128, John of Worcester, Chronicle of World and English History (Corpus Christi College MS 157). 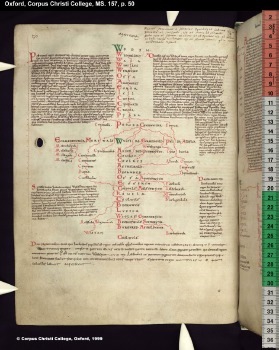 This book contains eight genealogies of Anglo-Saxon and Norman kings (pp. 47-54), one of which is shown above. I have not seen this book, but the illustrations are apparently confined to those from the 12th century, making the diagram contemporaneous with the two listed above. The Tree of Jesse normally appears in Medieval Christian art as a richly illustrated genealogy of Jesus in illuminated manuscripts, but apparently this one was an exception.